In order to shore up confidence and stability in the Eurozone, Mario Draghi, President of the European Central Bank, told an audience at the Hertie School of Governance on 19 September that the key to growth and avoiding crises in the future lies in the single market. 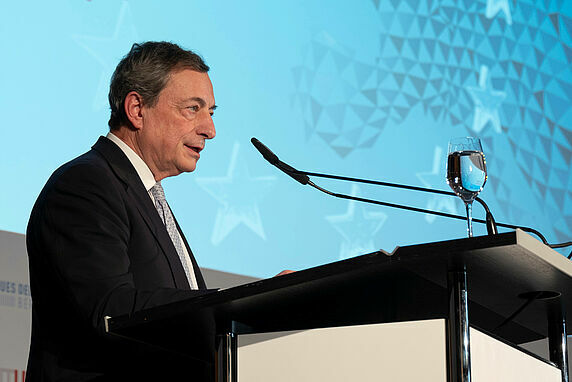 Draghi was the keynote speaker at the conference Making Europe’s Economic Union work, attended by around 350 people from government, academia, the media and others. 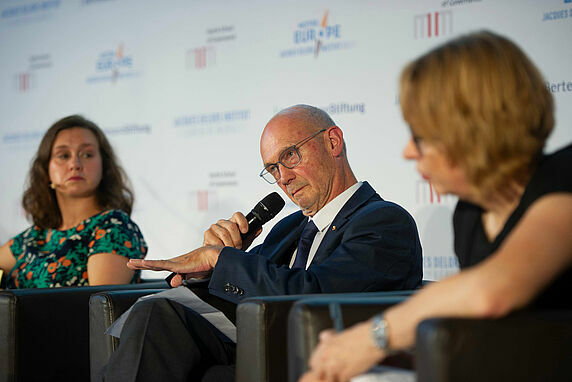 The conference was hosted by the Bertelsmann Stiftung, Hertie School of Governance, Jacques Delors Institute in Paris, and Jacques Delors Institut - Berlin. Draghi said both public and private risk-sharing were required to shore up confidence in the Eurozone - in particular a new fiscal instrument to complement monetary policy. But, he noted, such a tool must address moral hazard to reduce risks. “There ought to be an instrument that complements monetary policy in delivering macroeconomic stability both at the euro area level and, crucially, in each of its member states,” Draghi said. 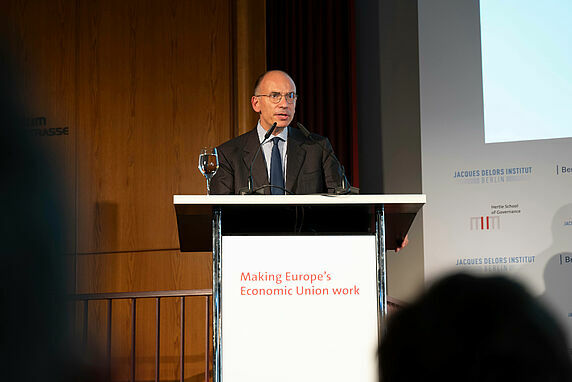 Henrik Enderlein, Hertie School President and Director of the Jacques Delors Institut – Berlin, welcomed participants, who sparred on topics that ranged from how to avoid financial crises in the future, to the fallout from the United Kingdom’s imminent departure from the EU, and the recent budget proposals by French and German finance ministers. 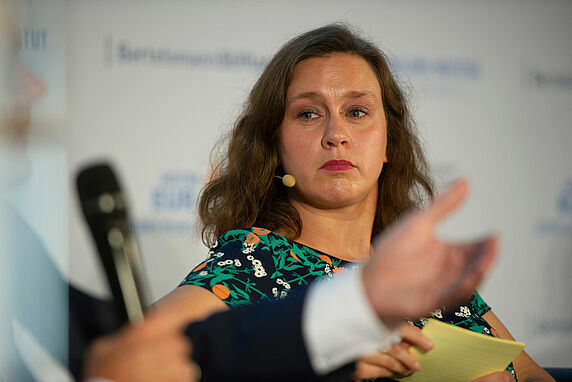 Bartsch stressed the importance of the electorate to gain support for a reform of the economic and monetary union, while Olaf Scholz said it was vital that reforms are agreed before another crisis happens. 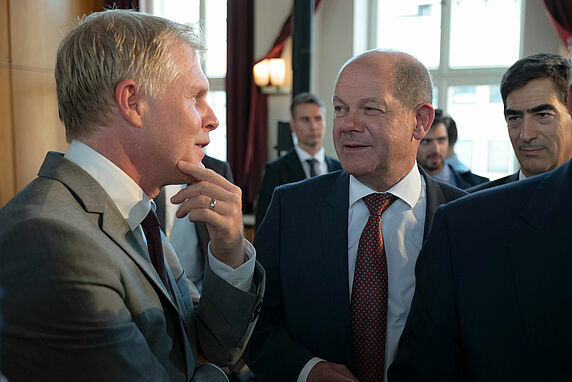 “It would be a great pity if we haven’t established all the instruments necessary” before it happens, Scholz said. Jacques Delors, former European Commission President and a founder and staunch supporter of the single market, also addressed the audience in a letter read by Pascal Lamy, President Emeritus of the Jacques Delors Institute and former WTO Director-General. Delors emphasized the importance of building up the economic and social pillars of the European Economic and Monetary Union. 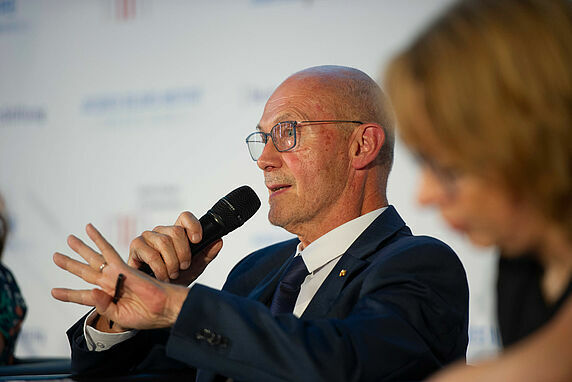 Enrico Letta, President, Jacques Delors Institute in Paris, Dean of the School of International Affairs at Sciences Po Paris (PSIA) and former Italian Prime Minister, also gave remarks and Aart De Geus, Chairman and CEO, Bertelsmann Stiftung gave the closing statement. Watch the video of the conference. Read Jacques Delors' full message in English or in French. Read Mario Draghi's speech in English.